I must say, hopefully without sounding too smug, that I love living in Asia. I love living in a region others refer to as exciting, exotic, and mysterious. I guess, if I am completely and totally honest, I always wished I was a bit more exciting, exotic, and mysterious myself. Years and years of self-tanning, real-tanning (I’ve tried it all, from beer to baby oil), hair-straightening, starving, and quit a lot of tears are a testament to this quest. Thankfully, I’ve come a long way since then and have learned to accept that outside appearance (no matter how pale or round) does not have anything to do with inside fervor. So I’ve claimed my Asian-ness as something that is rightfully mine…down to the very bones and blood, by birth and by God-given right (as it should be seeing that I was bred, born, and raised here!). I try to live it to the fullest measure – the beaches, the flip flops, the amazing fresh seafood that I can pick so to the bones with my hands that even a wily cat would have nothing left. The flavors that are brazen, brilliant, and not for the faint of heart. Piquant native onions. Sili labuyo – our tiny, native bird’s eye chili that can bring a grown man to his knees. More garlic than deemed decent. Knobs of ginger always (always!) present in our aromatics bowl. Wansuy (cilantro) – that bright, green, unmistakable herb whose smell can send me into a happy trance. Gata (coconut milk) – that lends a special creaminess to both savory dishes and desserts. Tanglad (lemongrass) – a hardy stalk that grows wild, with a unique lemony flavor all its own. Bagoong (shrimp paste) – Famous/infamous for its pungent bouquet. Patis (fish sauce) – Adds a savoriness that is much more robust than salt alone. And that’s not even taking into account all the dazzling, colorful, and can’t-be-ignored flavors that hail from my other Asian neighbors – Kaffir lime, Thai basil, Vietnamese mint, Curry, star anise, sriracha, sambal, soy sauce. So many ways to be delicious. 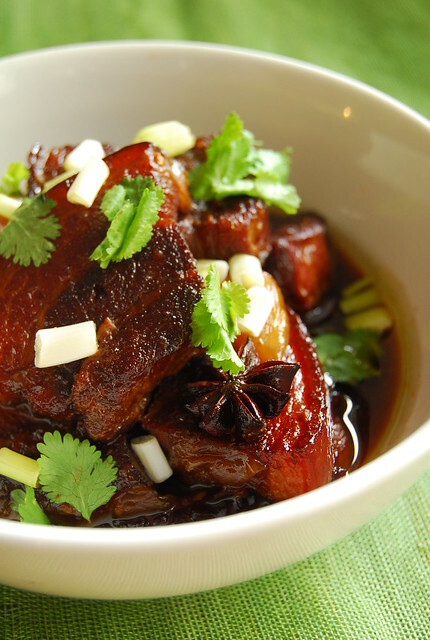 – Par-boil pork belly: Put the pork belly in a wok containing enough boiling water to cover the meat completely. Continuously skim off the scum as it forms on top of the boiling water. Boil for about 20 minutes then drain the pork belly and set aside to cool. The boiling liquid can be reused for the braising after straining through a fine sieve. When the pork belly is cool to touch cut it into pieces of about 1.5 inches cubes. – Melt the sugar and the vegetable oil in a wok over medium high heat. Continue heating until the sugar is slightly brown, about 3 minutes. Add the cubed pork belly and brown it with the caramelized sugar, about 8 minutes. Be careful as it may spit and sputter and you don’t want any hot-fat-and-molten-sugar napalm to get on you. – Add the star anise, ginger, garlic, cilantro root/culantro, shallots, chili, orange peel, and the green parts of the green onions to the pan. Brown a bit and let them pick up all the caramelized bits. – Add soy sauce, shaoxing, and enough water (or par-boiling liquid) to almost cover the meat. Cover and stick in a pre-heated 350F oven until meat is tender, checking occasionally to make sure it is not drying out (and adding some of the par-boiling liquid if it seems too dry). This could take 2-3 hours. You want it meltingly soft with the fat relaxed and jiggly. – When meat is tender, remove from oven and simmer rapidly, uncovered, on the hob until sauce has reduced a bit. – Garnish with white and light green parts of the green onions as well as cilantro. I love pork belly. It is an awesome cut of pork and so agreeable to a long, slow cook. It becomes unctuous and soft and oh so decadent. And it is the perfect canvas for Asian flavors. I especially like it when prepared in a way that renders it sticky, sweet, and spicy – all of which this dish does. I like to use it with the bone in and the skin on because this really adds body to the sauce. This recipe is based on the ones I found here and here. Caramelizing the pork belly in melted brown sugar is something I have never done but is so worth it. I like to finish it in the oven as I like using its gentle heat in dishes like this. We have this on a pile of steaming rice, but I think it would also do well atop a mound of egg noodles. All this rhapsodizing is not to say I don’t get equally passionate about cuisines on the Western hemisphere…or the ingredients and produce you find there. I do! But there is something about the personality of Asian cuisines that is so disarmingly audacious, at the same time preciously familiar (to me), that it will always own a part of me. And I it. And I'm attempting to get a decent tan in the next few weeks…! Love this post! Made me laugh remembering how I also tried my hardest to be tan (using beer was also one of my desperate measures) but at long last I've come to accept I won't look like an exotic beach goddess. Ohhhh I will definitely try this recipe for my favorite cut of pork (too!) Thanks for sharing! Red-cooked pork is one of my favorite dishes, so thanks so much for the recipe! Hi Ling! They are truly so vivid! And I am no stranger to the cravings you get when away for too long! I think my days of intensive tanning are over…it never "takes" for too long anyway! Hi chef_d! Hehe! Yes, I guess we just have to accept that we are goddesses of a different sort 🙂 Hope you enjoy this dish! Hi Midge! Hope you like it! This look so good! I've been meaning to try pork belly again (I've only cooked it once before) and this recipe may just be the perfect dish to try. My tastebuds are going crazy just looking at this photo! Question-What gives the pork the red colour? I also LOVE Asian cuisine for all the reasons you mentioned — ginger, gata, and most especially, garlic! Hahaha! I'm also a big fan of pork belly — This recipe looks delicious! Great post, Joey! Big hug! Hi Wizzy! I actually have no idea how it gets the red color…it just does! 🙂 Maybe it’s the caramelization? Hi Tin! Hope you enjoy it! The vivid colors send signals to my brain, then it orders my tummy to produce acids. Excellent color on the pork. I love pork belly cooked in any way, will give this recipe a try someday. I arrived at your site after searching for semolina porridge – and quite pleased to find it! I adore pork belly and your recipe sounds absolutely delicious. I will have to try this! Hi Eric! Hehe…hope you were able to satisfy your hunger!